Jack and Jill went up the hill to fetch a pail of water. The only problem is, the well has a leaky bucket. The water runs out of the holes in the bottom of the bucket. A submersible pond pump (not sold through Meisel's but available at hardware stores) pumps the water from a large bucket at the bottom of the well into the leaky bucket on top. 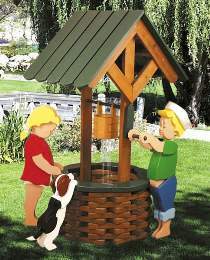 Jack is positioned so his hands grasp the handle of the wishing well crank. Jill and her dog watch intently as the water runs out the bottom of the bucket and disappears back down into the well. Patterns for all project pieces drawn FULL SIZE. Order Well, Jack & Leaky Bucket, and Jill & Dog plans separately below or see *Special.